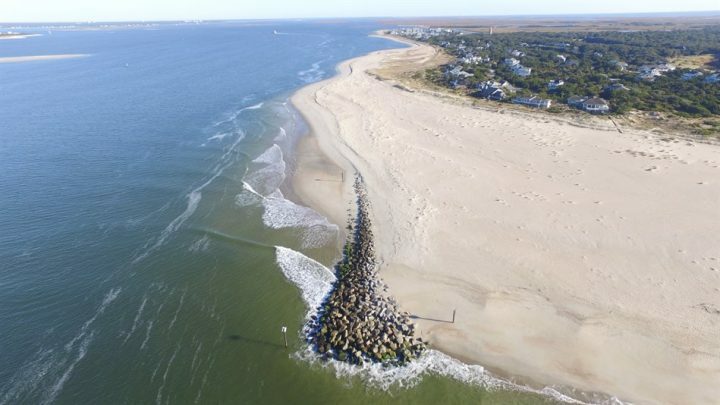 WILMINGTON, N.C. – When the long-standing state ban was lifted on terminal groins, a handful of beach towns jumped at the chance to build a case for why a hardened erosion-control structure would be their best line of defense against losing sand. Nearly eight years after the North Carolina General Assembly repealed the ban in 2011, only one terminal groin has been built. The ongoing debate over the structures rages – whether they’re more harmful than helpful in the long term and how much beachfront property they protect. A lawsuit has stalled one proposed project. After years of studies and hundreds of thousands of dollars expended, elected officials in another town stopped short from applying for a federal permit to build a groin. An environmental group-led campaign launched a yearslong fight against proposed plans for a terminal groin at Rich Inlet. When the legislature repealed the decades-old ban of terminal groins on the coast, environmental groups and some of the most prominent coastal scientists in the state spoke out against the rule change. The North Carolina Coastal Federation went on record opposing construction of terminal groins at any beach in the state shortly after the repeal, which allowed up to four “pilot projects” to be constructed. Months later, the legislature tacked on two more, permitting up to six of the structures to be built on the coast. Figure Eight Island, the exclusive, private barrier island in New Hanover County, was the first to kick-start its yearslong process of environmental studies required by federal and state regulatory agencies. 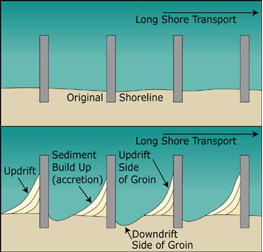 The federation in 2011 launched a “Save Rich Inlet” campaign to educate island property owners about the negative effects a terminal groin would have at the inlet, which is one of the last naturally functioning inlets in the state.